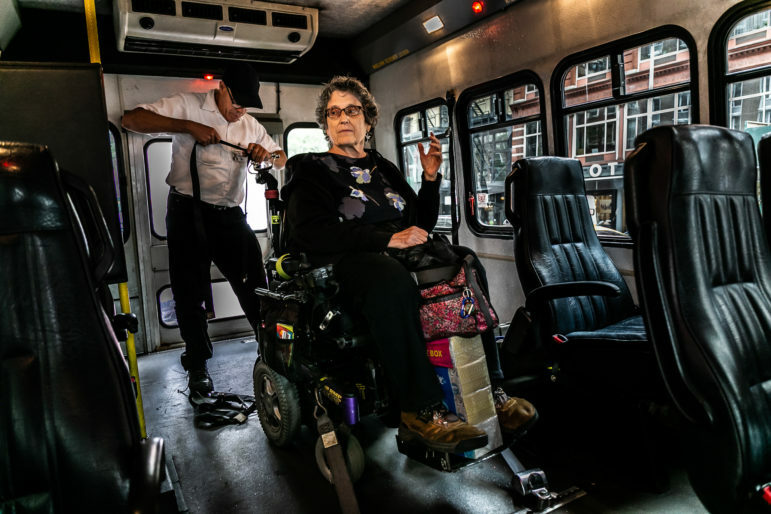 Jean Ryan, a member of the advocacy group Disabled in Action, waits for her wheelchair to be harnessed in an Access-A-Ride van. The transportation authority has proposed two options for fare increases, which are slated to take effect in March. The first would retain the current $2.75 fare price, but eliminate the existing 5 percent bonus for purchases over $5.50. The second option would hike the base fare to $3, but offer a 10 percent bonus on any transaction over $6, according to the plans. It’s the second proposal that’s drawn the ire of those who use Access-a-Ride (AAR), the MTA’s shared car service for New Yorkers with disabilities. AAR users cannot use MetroCards to pay for trips on the system, and instead are required to pay the exact fare in cash—meaning they won’t be eligible for the 10 percent bonus under the MTA’s second fare hike option. So while many subway and bus riders would be able to take advantage of the bonus, bringing their adjusted base fare down to $2.73 per ride, AAR patrons would be forced to pony up the full $3 each trip. The current $2.75 fare paid by AAR users, another paratransit user testfied, is already higher than what most subway and bus riders who can purchase monthly or weekly MetroCards pay. Many who use AAR do so because they have fewer alternatives, as a majority of the city’s subway stations are still inaccessible. 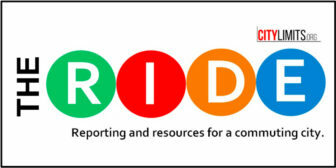 The fare hike would be especially egregious, another speaker said, since many AAR users complain the service itself remains cumbersome and inefficient: Riders must book their trips a day or two in advance and be outside to meet their drivers within five minutes of their scheduled pickup time, or the driver will leave. Since the service is shared, it can mean users are subjected to long, meandering rides—often to boroughs outside their destinations—to pick up and drop off other passengers. “I can’t believe that there are proposals for a fare hike that would increase the cost of AAR trips by almost 10 percent, even though you know that most of the people that this would affect live on fixed incomes, and the service does not seem one percent better,” said Janice Bartley, a disability rights advocate. The MTA says it’s working to improve accessibility on a number of fronts: New York City Transit President Andy Byford’s “Fast Forward” plan includes an initiative to install elevators at 50 additional subway stations in the next five years, and the agency hired its first accessibility adviser last year. It also rolled out a pilot program that allows about 1,200 AAR users to book their rides on demand through an app, a more flexible option than the current system. But that e-hail program proved more popular, and expensive, than the MTA initially expected, and overall paratransit costs are increasing at a time when the agency is also grappling with declines in projected fare and dedicated tax revenue. But advocates say the proposed $3 fare structure option is unfair not just to AAR users, but to low-income transit riders in general, many of whom aren’t always able to pay for more than a trip or two at a time and so can’t take advantage of the bonus, as those who can afford to pay more upfront can.